I’m excited to be back to share another one of my favorite recipes. If you’ve visited my blog, Bakerette.com, you’ll quickly know that I love bread. Absolutely in love. You’ve probably already gotten a big overdose of bread recipes there. But I won’t apologize! 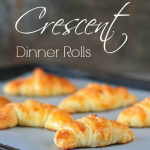 I’ll only feed my frenzy by sharing another one of my favorite bread recipes: homemade crescent dinner rolls. These crescent rolls are sweet, light, buttery and fluffy. The dough is made the night before, refrigerated, and baked the next day. Make the dough the night before. In a small bowl, dissolve yeast in warm water for approximately 5 minutes until foamy and activated. With an electric mixer on low, beat together egg, sugar, and salt. Set aside. In a small saucepan, melt the butter on medium heat. When it melts and starts to bubble, whisk in the milk and remove from the stove. Add the butter mixture to the egg mix. Add the activated yeast and stir. Gradually add flour one cup at a time mixing well after each addition. The dough will be pretty sticky and not stiff. This is the desired result. Add just enough flour until the dough pulls away from the sides. Cover the dough and set in the refrigerator overnight. Remove the rolls from the refrigerator about 3-4 hour prior to baking. Turn the dough out onto a lightly floured surface and divide into two equal portions and form each half into a ball. Slight flatten the top of the dough into a disc and lightly dust the top with flour. Roll the odugh out into a 14-inch circle. Melt the remaining butter and pour ¼ cup of butter to hte middle of the dough and with a spoon, spread the butter out to within one inch of the dough's edge. Using a pizza cutter or sharp knife, cut the circle in fourths and each fourth into thirds making 12 triangles of dough. To shape into a crescent, begin with the wide end of the triangle and gently roll it toward the tip. Line a baking sheet with parchment paper and place the crescents seam-side down on the sheet. Cover with a dish cloth and let rise until double in size, about 1-3 hours depending on the heat of your home. Bake at 375 degrees F for 15-18 mins. Make Homemade White Bread in the Crock Pot! Thank you, Desiree, for letting me share this recipe with you all today! Oh my goodness, everything looks great as always! came across your website after my son and I went to the grocery store to purchase pillsbury crescent rolls. When I looked at all the preservatives in it, I decided not to buy it. I thought I’ll make my own from scratch. Well, I’m so glad I found your recipe. My whole family absolutely loves it! I will try the bread in a crockpot too! Thank you for sharing your healthy recipes with us busy Moms. It was a quick and easy recipe. I use crescent rolls to make pigs in a blanket. I use to use the can biscuits, but one day used the crescent rolls one. Now my family won’t eat them unless I make them with the crescent rolls. I am so glad to find this recipe because it is just as easy to make them than buy them! Thanks! does this work for replacing Pillsbury Crescent rolls in recipes? I make great crescent rolls from scratch, but they are not good as a replacement. These kind of look like the ones from the cans which would be terrific in taco rings and such. I have to give this a try, I’m slightly addicted to crescent rolls and never buy them because I’ll eat all of them in one sitting. Thanks so much for sharing! Desiree’ and Jen! These look absolutely delicious! Totally pinning! I love homemade bread. I can’t wait to try these. They look so good.